This afternoon we made a visit to Patmos. I am using an Internet Cafe in Patmos to connect. The cost of Internet on the ship is $1.60 per minute!!!! I decided to share with you an article I wrote some time back for Biblical Insights. The photos were made on a previous tour. Later I will try to post some of the photos I made today. I think they will be better. John, the writer of the book of Revelation, was “on the island called Patmos, because of the word of God and the testimony of Jesus” (Rev 1:9). I am convinced that this was the apostle John. He was there because of (Greek dia, on account of) the word of God. Filson says this could mean either banishment, or banishment to hard labor. He points out that the word of God and witness or testimony are used in Revelation 6:9 and 20:4 “in reference to a persecution situation” (Interpreter’s Dictionary Bible III:677). The Romans used the island as a penal settlement to which they sent political agitators and others who threatened the peace of the empire (Tacitus Annals 3.68; 4.30; 15.71). According to Eusebius, John was banished to Patmos by the Emperor Domitian, A. D. 95, and released 18 months later under Nerva (HE III.18.1; 20.8-9). A view of the harbor on the island of Patmos, the place where the apostle John received, and possibly wrote the Book of Revelation. This photo was made from Chora, looking down to the port of Skala. Photo by Ferrell Jenkins, 2008. 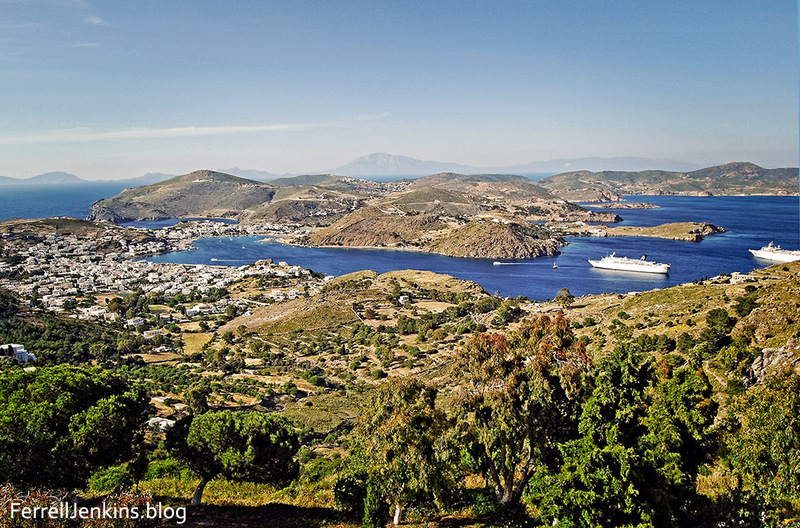 Patmos is a rocky island off the west coast of Asia Minor in the Aegean Sea, about 37 miles southwest of Miletus. The island is one of the Dodecanese (twelve) or of the Southern Sporades. It is about 10 miles long (N–S) and 6 miles wide at the north end, and consists of about 22 square miles of land area. The island is mountainous and of irregular outline. Some visitors to the island have suggested that the natural scenery “determined some features of the imagery of the Apocalypse” (HDB III:693-94). Patmos has been a part of Greece since 1947, and may be reached by boat from Piraeus, Samos, Kos, or Rhodes. The ferry from Samos takes about 2 1/2 hours, arriving at the port of Skala. Our cruise ship sailed from Kusadasi, Turkey, to Patmos. On the way from Skala to Chora, the only other town on the island, one passes the Monastery and Cave of the Apocalypse. This site is marked as the traditional place where John received the Revelation. At Chora, the monastery of St. John the Theologian dominates the island. It was built by a monk called Christodulos (slave of Christ) in A. D. 1088. The monastery library is noted for its manuscripts, but especially for its collection of more than 200 icons. The oldest book in the library is part of a 6th century codex of Mark (Codex Purpureus). The second oldest manuscript is an 8th century A. D. copy of Job.